The Fostoria Nappy and Cover was a very popular piece in the American line. So popular, in fact, that it has a Look-Alike cousin in the American Whitehall pattern. 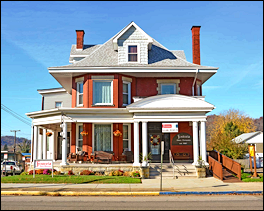 Many times people confuse the two, and it is not uncommon to see the American Whitehall piece being sold as genuine Fostoria American. 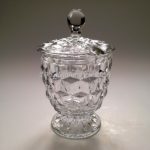 The American Whitehall piece is called a “Candy Box/Cover”. 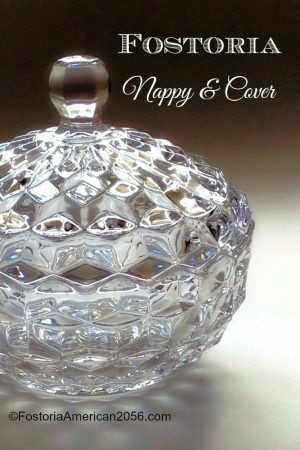 The Nappy Cover (or Lid) is approximately 3” high and has an inside retainer ring of clear glass. Interestingly enough, the Nappy Cover is very similar (if not exact) to the Cover of the Comport piece. This is good to know, especially if one piece is damaged and you need to interchange the two pieces. That being said, the different Covers don’t always fit on the bottom pieces. My personal Cover for the Comport does not fit the bottom of my Nappy. While similar in size and dimension, the weight of the piece is different and does not make a good fit. In fact, if I forced the situation, damage would occur. Therefore, be aware – while the Nappy Cover and the Comport Cover look very similar, it is quite possible you won’t get a good fit when you try to interchange the different pieces. 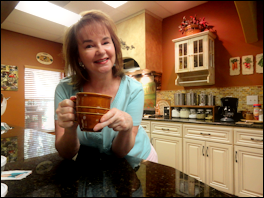 My best advise is to take the bottoms with you when searching for a replacement top. The Nappy and Cover is approximately 5″ in height. 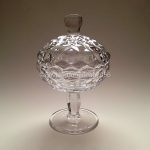 It is a nicely weighted item, and sits securely on the table. 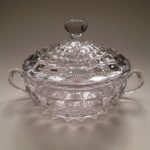 While Fostoria Glass officially called this piece a “Nappy”, it is also referred to as a Candy Dish by many. The Nappy and Cover was produced for many years and is still fairly easy to find in the aftermarket. 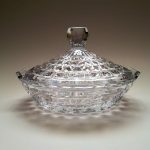 If you find a similar dish in color – not clear crystal – then it is probably the American Whitehall version. 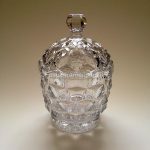 The Look-Alike piece was manufactured in a variety of colors – such as Blue, Ruby, Green, Blue Carnival – and even clear crystal. If you are interested in purchasing this piece, please click the following sponsored link for available Nappy and Covers on eBay.